At Survivor Series, WWE Cruiserweight Champion Buddy Murphy will face his first major challenger – The Heart of WWE 205 Live, Mustafa Ali. At WWE Super Show-Down Buddy Murphy defied all expectations, winning the WWE Cruiserweight Championship in his hometown of Melbourne, Australia and handing Cedric Alexander his first defeat of 2018. With Alexander not performing to WWE 205 Live General Manager Drake Maverick’s standards in the aftermath of his loss, Murphy’s training partner Tony Nese and Ali faced off to determine who would challenge The Juggernaut. Pushing himself to his physical limits, Ali defeated The Premier Athlete and earned the opportunity to challenge for the title. The WWE Universe is certainly in for a treat, as Ali and Murphy have battled each other before, including when they met in a wild No Disqualification Match that WWE.com ranked as the best bout in the first 100 episodes of WWE 205 Live. Both dudes are some of the best performers on not just 205 Live but the main roster as a whole, and I expect this to be easily match of the night. It's a rare situation where I'll be delighted with whoever wins, Ali or Buddy. There is a chance that Buddy isn't supposed to have a lengthy reign here and they just gave him the win in Australia as he's one of the few Australian wrestlers they have. I always thought Ali was the one being built up to and showcased enough to beat Cederic for the title, so maybe he will win here. My instincts say Buddy steals a win and they rematch on an episode of 205 Live. Either way, this should be great stuff. These two have tremendous chemistry with one another. The title took a hit with Alexander as the champ? I'd go wit this however i'd say we'll see the rematch at TLC. As far as the "champion taking on all comers" theory... isn't that what they were trying to do with Alexander all this time?.. I think a long term building of the prestige of the cruiserweight can only happen if they bring the title to Raw or Smackdown and have guys like Balor, Zayn and Mysterio battle for it.... Lio Rush is possibly a step towards that, pure speculation of course, but I'm getting off topic. I don't know who will win here, but I'm not expecting a lengthy title reign from Buddy, (or from Mustafa if I'm being honest) but I DO expect Ali to win at some point - if only so they can put former champion on his resume, he deserves as much... 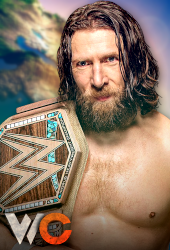 Survivor series seems like a good opportunity for that, unless they feel the need to continue the angle on 205..
so yeah, I basically just agree with what Ed said, Murphy only really got the gold to pop the Melbourne crowd, a good option for champ don't get me wrong but I will say Ali wins it off him, and soon. This match is a toss up, and you know what? Who cares. Both guys are awesome so it's a win-win situation as far as who walks out as champ here. Ali should have won the title at Mania IMO. At this point I kind of hope they have Murphy retain here and then rebuild Ali towards winning at next years Mania. This should be a very good match. Haven’t been following 205 LIVE for a few months. Ali’s time has to come eventually, don’t think it’s going to happen tonight. Expecting Murphy to retain.